We carry a wide selection of forklifts. Diesel or propane powered, available in either 6000 or 10,000 lb class. Rough or smooth terrain, we have your ideal lift. We also carry a telescopic forklift (Also known as a Zoom Boom). Contact us to discuss your needs. Of course we rent forklifts, but sometimes, space is a factor, and to move that pallet, we offer for rent pallet jacks. 5000lb capacity, and available in manual or electric operation. We also have a Pallet stacker, perfect for the small warehouse or shop. Drywall Work? We got your back! Our Panel Jack is perfect for drywall work. Save your back, and have great productivity when working alone. 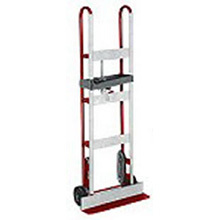 This unit can lift full sheets of drywall 12′ high, plus has an available 18″ extension. Flat ceilings, vaulted ceilings and walls. A truly unique product. Move your appliances across delicate flooring on a cushion of air. Up to 650 lb capacity, for smooth surfaces only. You can move your stove with your pinkie finger!